Mahendra Kapoor (9 January 1934 – 27 September 2008) was an Indian playback singer. In a long career spanning decades, his repertoire included popular songs such as 'Chalo ek baar phir se Ajnabi ban jayen hum dono' (Gumrah) and 'Neele gagan ke tale' (Hamraaz). His name however became most closely associated with patriotic songs including 'Mere Desh Ki Dharti' in Manoj Kumar's film Upkaar. In 1972, he was awarded the Padma Shri by the Government of India. He lent his voice to actor Manoj Kumar in most of his films and had a lengthy association with director-producer B.R. Chopra. Mahendra Kapoor was born in Amritsar, but soon moved to Mumbai. At an early age he was inspired by legendary singer Mohammed Rafi and considered him his mentor, he started learning classical music under classical singers like Pt. Hussanlal, Pt. Jagannath Bua, Ustad Niaz Ahmed Khan, Ustad Abdul Rehman Khan and Pt.Tulsidaas Sharma. Kapoor created a style of his own moulded largely on Rafi, and won the Metro Murphy All-India singing competition, which led to his debut as a playback singer in V. Shantaram's Navrang in 1958, singing Aadha Hai Chandrama Raat Aadhi, under the musical direction of C. Ramchandra. Some of Kapoor's most notable songs were the ones he performed in B.R. Chopra's films (Dhool Ka Phool, Gumrah, Waqt, Hamraaz, Dhund and Nikaah) and for Manoj Kumar (Upkaar, Purab Aur Paschim). Kapoor had a very large vocal range, and he is sometimes known as The Vibrant Voice of India. He was the first Indian playback singer to record music in English. He was asked by the group Boney M to sing their songs in Hindi with Musarat from Pakistan, which resulted in the Pop Album M-3. Some of the songs on the album are "Chori Chori Chalo!! "(Original, Hoorray! Hoorray! by Boney M), "O Meri Champe Ki Daali". Most of the hit songs sung by Mahendra Kapoor which are famous, are from B.R. Chopra movies or Manoj Kumar's movies. His song from 'Bandhan', 'Shakti'. 'Doli', 'Ek Nazar', 'Admi Aur Insaan', 'Sangam', 'Tawaif' are also quite popular. Mahendra Kapoor also sang a duet with Mohammed Rafi. The song was "Kaisi Haseen Aaj Baharon Ki Raat" from the 1967 film "Aadmi", which was originally recorded as a duet with Rafi and Talat Mehmood. Manoj Kumar, one of the lead stars refused to use Talat's voice for him and the song was re-recorded with Kapoor replacing Talat. Mahendra Kapoor also sang the dohas, mantras, chopaiyan and also Title track of Mahabharat 1988 TV series. Kapoor sung in a large number of Indian languages, and is the playback singer who has performed in the largest number of in Gujarati, Punjabi, Bhojpuri and Marathi movies. He also performed the title song for the TV series Mahabharat. In Marathi he was very popular for being the voice of Dada Kondke in all his movies. In spite of being associated with Dada Kondke's colloquial style his singing for Marathi movies was not limited to Dada Kondke's movies only. Kapoor was married and had three daughters and also one son. His son Rohan Kapoor is an actor and singer, who acted in a few films in the 1980s such as Yash Chopra's Faasle (1985) and Love 86 (1986), and Prakash Mehra's Imandaar, and later did stage shows together with his father. On 27 September 2008, Kapoor died following a cardiac failure at his home in Mumbai, aged 74. He was survived by his wife, children, children-in-law and grandchildren. 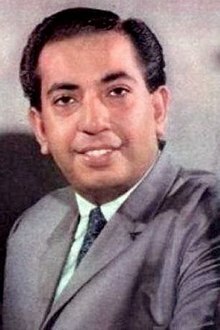 Mahendra Kapoor is one of the golden era singers when Mohd Rafi, Kishore Kumar, Mukesh and Manna Dey was ruling the main platform of playback singers of the bollywood. He remained as one of the most popular singer in the Bollywood who has given his voice to almost all of the popular heroes like Dilip Kumar, Shammi Kapoor, Raj Kapoor, Dev Anand, Shashi Kapoor, Biswajeet, Raj Kumar, Dharmendra, Amitabh Bahchcan, Manoj Kumar, Jeetendra, Vinod Khanna, Shatrughina Sinha and many more. For Punjabi movies he has given his voice to Varendra, Mehar Mittal, Prem Nath and many more. Madhu ithe ana chandra tithe..
Swapnaat pahile je te roop hech hote..
^ "Mahendra Kapoor: The voice of patriotism". Hindustan Times. 8 January 2010. Retrieved 13 September 2018. ^ Mere desh ki dharti' will always be with us Times of India, 28 September 2008. ^ 'Indian Express, December 2015. ^ Singer Mahendra Kapoor dies of heart attack Indian Express, 28 September 2008. This page was last edited on 29 March 2019, at 21:56 (UTC).